Iran is using diplomatic pouches to smuggle weapons into and out of the country, Defense Minister Moshe Yaalon said Monday. “The Iranians are taking advantage of diplomatic mail in order to transfer these items,” Yaalon told Guatemalan President Otto Perez Molina, who is visiting Israel. “They are taking advantage of the drug smuggling routes from South America into the United States in order to move weapons there,” he said. Iran, said Yaalon, was pulling out all stops in order to export its Shi’ite Islamic revolution to the West, preparing communities of Shi’ite Muslims for the day they must help Iran achieve its goals. It was via this network, he said, that the Iranians were able to smuggle weapons in the U.S. to attempt an attack on the Saudi embassy in Washington, which was foiled only at the last minute. 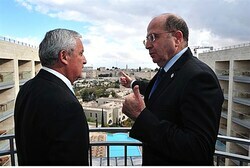 Israel, he told Molina, was carefully watching Iran’s latest moves in developing its nuclear capacity. “We have been damaged by their activities in Argentina, Bulgaria, and India,” Yaalon said, listing the locations of several attacks against Israelis and Jews in recent years. “All Iranian embassies are used as terror bases,” he added. The presence of Iranian-linked terrorist networks in Southern and Central America is a longstanding issue, most notably in the ongoing controversy over the involvement of Iran in the deadly bombing of the Argentine Jewish Charities Federation in 1994. Lebanon’s Hezbollah is known to have a particularly strong presence in the region, and is said to be heavily involved in the local drug trade as part of the group’s fundraising efforts. In September, the son of the president of Suriname was arrested on suspicion of providing material support to the Shia terrorist group. Dino Bouterse was filmed telling undercover agents posing as Hezbollah operatives that he was willing to help them set up a base in the Central American country, as well as to provide them with passports and advanced weaponry, including surface-to-air missiles, as part of preparations to attack the US and Holland. ← Technical experts from Iran, world powers and the UN atomic watchdog will start working out on Monday the nuts and bolts of implementing last month’s landmark nuclear deal, reports AFP.